PMP: Project Management Professional Practice Tests provides candidates with an ideal study aid for PMP exam preparation. Fully aligned with the A Guide to the Project Management Body of Knowledge (PMBOK® Guide), 6th edition, this book provides practice questions covering all five performance domains. Five unique 160- question chapter tests, as well as one practice exam cover Initiating; Planning; Executing; Monitoring and Controlling; and Closing to help you pinpoint weak areas while there is still time to review. An additional 200-question practice test provides a bonus exam--1000 questions in all--, and a year of FREE access to the Sybex interactive online learning environment puts a test bank, practice questions, and more at your disposal. The PMP exam is a challenging four-hour, 200-question validation of your project management knowledge. Mimicking exam conditions is one of the best ways to prepare, and this book is designed to test your knowledge, focus, and mental endurance to get you fully prepared for the big day. In todays IT marketplace, qualified project managers are heavily in demand as employers increasingly require those who are capable of managing larger and more complex projects. The PMP certification shows that you know, understand, and can practice PMBOK guidelines to a rigorous level, and is considered the premier project management qualification out thereso when exam day arrives, complete preparation becomes critical to your success. 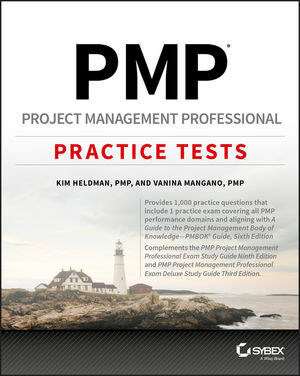 PMP: Project Management Professional Practice Tests help you gauge your progress, preview exam day, and focus your study time so you can conquer the exam with confidence. To register for access to the online test banks included with the purchase of this book, please visit: www.wiley.com/go/sybextestprep. Kim Heldman, PMP, is the Sr. Manager, IT/Chief Information Officer for the Regional Transportation District in Denver, CO. With more than 25 years of project management experience, she is the author of the bestselling PMP Project Management Professional Study Guide. Vanina Mangano, PMP, is an executive member of Never Limited LLC, which owns The PM Instructors. She has authored courseware material on project management, including PMI Risk Management Professional Exam Preparation. https://www.efficientlearning.com/pmp/ Sybex PMP Exam Review Courses Available!